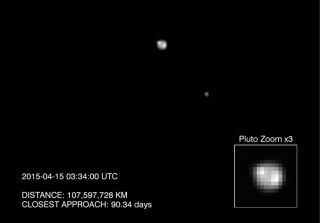 NASA's New Horizons spacecraft snapped this photo of Pluto (center) and its largest moon Charon on April 15, 2015. The image, which hints at surface features, is one of several views captured over several days from a range of between 69 million miles (111 million kilometers) to 64 million miles (103 million km). A Pluto-bound NASA probe has captured the best-ever images of the dwarf planet, revealing surface features that include a possible polar ice cap. The photos were captured in mid-April by NASA's New Horizons probe, which will make the first-ever flyby of Pluto on July 14. The new images have been combined into a movie that reveals large bright and dark patches on Pluto, suggesting that the dwarf planet has a complex and varied surface. NASA’s New Horizons probe took this image of Pluto and its largest moon, Charon, on April 17, 2015, from a distance of 64.85 million miles (104.368 million kilometers). "These images that you see in this animation sequence are what I call my 'meet Pluto moment,'" he added. "Seeing it go from a point of light to an actual place that we're approaching was actually a little bit emotional." This graphic shows the trajectory of NASA's New Horizons spacecraft as it visits Pluto and travels even further from Earth. "That may be evidence for a polar cap, which could be very, very exciting," Stern said, adding that compositional data gathered by New Horizons' onboard spectrometers in June should settle the question. The New Horizons team doesn't yet know what's responsible for the brightness variations across Pluto. "It's a mystery — whether these bright and dark regions are caused by geology or topography or composition," Stern said. "But New Horizons has the capability, as we get closer, to solve just those kinds of mysteries, and we're looking forward to that." The $700 million New Horizons mission launched in January 2006 to lift the veil on Pluto, which has remained largely mysterious since its 1930 discovery. The probe's images of the dwarf planet will get better and better over the next few months, with the crescendo coming on July 14, when New Horizons will zoom within 7,800 miles (12,500 km) of the icy world's surface. "This is just an appetite-whetter," Stern said of the new images. "We are now on the verge of making real discoveries — the maps and the other data sets that we came to get at the Pluto system."